Media captionSupermarket staff specially opened a checkout so the youngster could scan shopping. 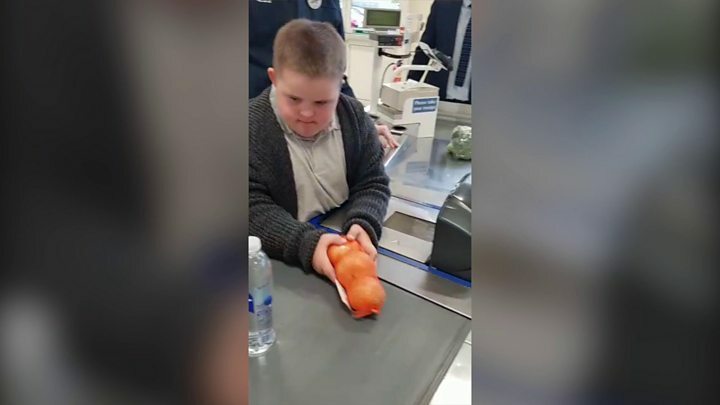 Supermarket staff have won praise from the father of a 10-year-old boy after allowing his son to scan their shopping in store. David Burke said Jay, who has Down's syndrome, was "over the moon" when staff at a Tesco store in Bradford specially opened a checkout for him. Mr Burke had been trying to coax Jay away from scanning the shopping when the store manager stepped in to help. He said: "A massive well done to the staff - Jay was thrilled to bits." The father and son, who are regulars in the Great Horton Road store, were shopping on Saturday when staff saw Jay was keen to put the shopping through himself. He said: "Everyone there always makes a huge effort to making shopping that bit easier for us. "If you have a child with a learning challenge or challenging behaviour then you know just how traumatic it can sometimes be when out in a place like a busy supermarket." Mr Burke, a firefighter, said his son was "incredibly independent" and was always keen to do things for himself. He said: "He's a little charmer and it's amazing to be the parent of a child that bring the absolute best out in people. "We call him the Lord Mayor of Starbucks because every time we go into our local coffee shop he's always chatting away to people."